Love Being a Mummy : What do you REALLY need when pregnant? I thought I would write this post to help first time mums to be out!! I find that that leggings are a must, I loved them when i'm not pregnant but they are so comfy and stylish! Though finding long tops is sightly hard! I have used a few different makes over the 3 pregnancies but I have to admit the first pregnancy I went mad and my other half was very concerned that I would get stretch marks. I did not get one. Second pregnancy, I only used product in the last trimester when I felt itchy and same with this pregnancy, I am one of the lucky ones! 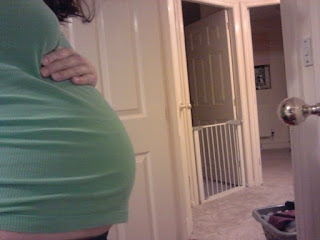 You can buy pillows especially for bump and beyond but I just put a normal pillow under my bump and it does the trick! If you are still working, I found that a bump band was brilliant! As I couldn't zip my trousers properly but I was too small for maternity clothes, a bump band just sat nicely over my bump and I felt like it was protected. I loved and love reading about pregnancy, other mums to be stories! Its a club, a very special one! I nearly forgot! You need a good bra that fits you well! I choose a maternity bra with the wire as I still wanted that shape! These are my recommendations! I hope they help!! !